While looking through a very popular home décor catalog, I came across dimensional wall art mostly done in metal I knew I could re-create. Roll the cut aluminum in the opposite direction to help remove the curl of the can. Next draw a shape of a flower and cut out or simply cut flowers out free-hand. Repeat steps for cutting cans and flowers. You will need at least 10 flowers. Place cut out flowers on soft surface and press in center to shape and manipulate. Edges can also be rolled using a pencil or pen. Cut out a piece of cardboard the shape of a vase. Lay cut out flowers and cardboard in position to determine placement layout. Cut off straight metal pieces from wire hangers for the stems, shape into curves and place under flowers on canvas. 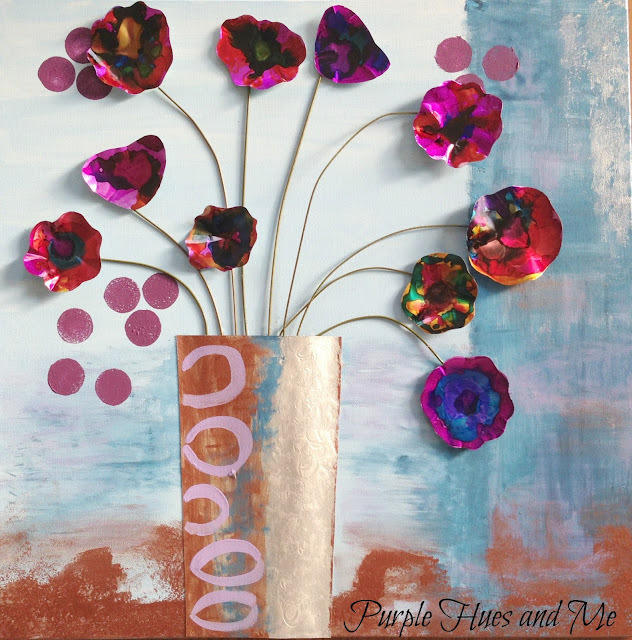 Begin coloring aluminum flowers with the alcohol inks. Alcohol inks are great for adding colors to non-porous surfaces such as aluminum. I used three colors - butterscotch, plum and blue to achieve so many different shades and hues just by dripping a drop or two onto the surface, swirling the ink around and using a q-tip to spread. Paint the canvas background and cardboard vase similar to the artwork found in the catalog. Unfortunately, the wall art is no longer available. Glue sides of vase using tacky glue and apply to canvas, lifting the cardboard so it doesn't lie flat and is open on top to allow for the wire stems. Add the wire stems by hot gluing ends and inserting into vase. Of course, I had to add some purple and switch it up a bit! Add hot glue to underside of flowers and place on stems. And it costs just a few dollars to create - as opposed to the high price tag for the original! Don't you just love a knockoff? Wow, wow, wow! I love this, Gail! Your soda cans looks like expensive artwork :) Happy day to you! Hugs! This is amazing Gail! I have to say that this is one of my favourite projects that you have ever done. It has a funky elegance that I really love. What a fabulous knock of! That is so creative! I love 3D art. Thanks for sharing at Thursday Favorite Things and have a happy 4th! Wow! I think you've outdone yourself. Great work. This is so cool! I like your version better than the Grandin Road. :) Pinning! Wow, this is awesome!! How creative to think of using pop cans! Thank you for sharing your outstanding creativity. I love the changes you made, as I am a purple lover too. This is simply awesome. Very impressive. Wow Gail this is so cool. Your creativity just amazes me. I would love to have this in my house. Beautiful! How big is the background canvas you used? Thanks! 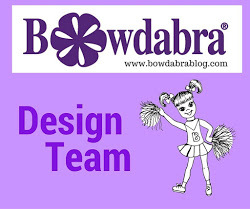 Thanks for sharing at the #sundaysdownunder linky party! I've pinned your post. Great job Gail! Love it! Wow oh Wow! Your lovely wall art is beautiful; 'tis so very creative and clever. Just visiting from the bottom of the world via Roses of Inspiration. 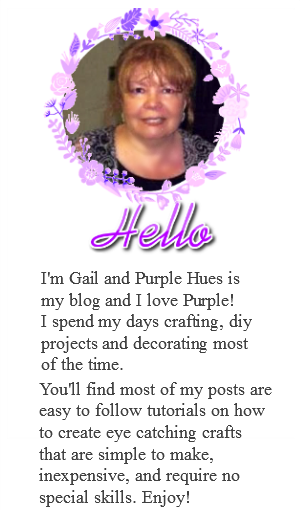 So, so happy to have happened upon your lovely blog. Oh my goodness! You certainly have a way with soda cans and paint! Gorgeous. I am waiting for your Queen of Crafting book to be published. This is the best hack I have seen. This is gorgeous! I love all the details. Thanks for sharing on Snickerdoodle Sunday! AMAZING!! wow Gail this is so lovely! what an awesome work of art! I love it!! I am going to have to get some of those alcohol inks to experiment with now, too cool like tie dye!! 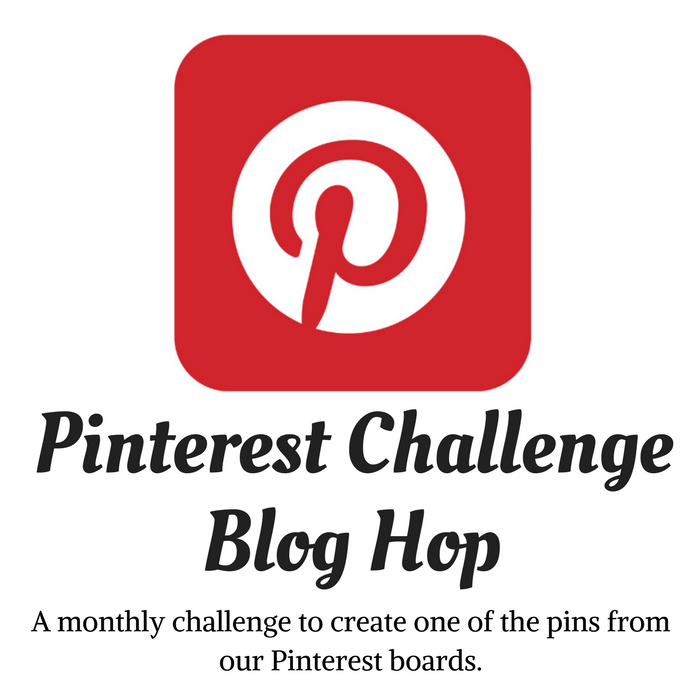 Thanks for linking to Snickerdoodle - I hope you will link to the creative challenge?!?! Thank you for sharing this tutorial at Friendship Friday at Create With Joy - you are SO talented! Your wall art is simply stunning! I love everything about it and your tutorial is fabulous too - if I had soda cans in the house, I'd be inspired to create a canvas of my very own right now! Congratulations - you are going to be "In The Spotlight" at this week's Friendship Friday Party (#180) - I hope you have a fabulous week! Wow! I love how this turned out! Thanks for sharing at Merry Monday, hope to see you again tonight! WOW! A true work of art! This is truly creative. Your skills amaze me, Gail! Again thanks so much for sharing with Creative Craft Challenge. You always bring new ideas to the table... in this case... that wall! Awesome! That is beautiful!! I've never heard of alcohol inks before, and will definitely be checking them out. Love this! Love it! Will be making one myself! Thank you! Gail, I have created my own versions of this four times now, with a specific person and color scheme in mind each time. The recipients have gone absolutely wild! The last one I took to the housewarming party, and sat near it as folks I did not know made comments on it. Even though the home was filled with fabulous art, the happy flowers seemed to pull people to them, and everyone wanted to know where she got the piece. After folks find out little ole me did it ( an NOT an artist), the next thing they say is, "You could SELL these - I know a dealer/gallery that would LOVE this." All nice to hear, but each piece was specific to one person, and perhaps the love and joy that went into it makes it special. Thank you so much for sharing this project. It's gotten me to experience the wonder and excitement of creating art pieces for fun, and I've branched off into other types of crafting as well. Hi Susan! Your lovely comments made me smile with delight! I am so happy you were inspired to make your own versions of this project to give as gifts to loved ones. Thank you so much! I normally email my response to comments, but unfortunately, you have a no-reply email and this is the only way of reaching you. Thanks again and I hope you are enjoying your newly found sources of crafting!